Last week I made sixty five meringues for a client. My fridge was teeming with egg yolks. So, like any sensible person, I took the Ice Cream Bible off the shelf and started reading. One of my favourite things about this book is that every time I flick through I discover a new gem I'd never really seen or considered before. It's a neverending source of inspiration. This is an ice cream for a dairy lover. A butter worshipper. A butterscotch fiend. A nut addict. 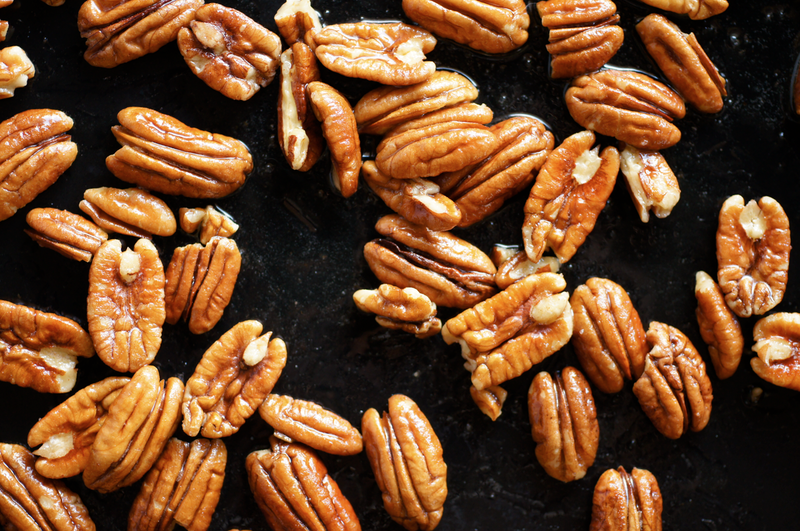 I'd never made or tasted buttered pecans before.I found that they needed to cool properly to taste their best. Pecans are definitely one of my favourite nuts, along with pistachios, almonds and peanuts. The smell that started wafting out of the oven when I toasted them was incredible. Truly mouth-watering. I took the scotch whiskey out as Mum doesn't drink and I'm not a huge whiskey fan. If you would like to add it back in, it's a tablespoon added at the end with the vanilla. At the moment I'm completely obsessed with my instant camera (a Fujifilm Instax 210, if you're interested). My friends bought it for my birthday this year and it's utterly awesome. I still can't get over the childlike feeling of magic as it develops in your hands. 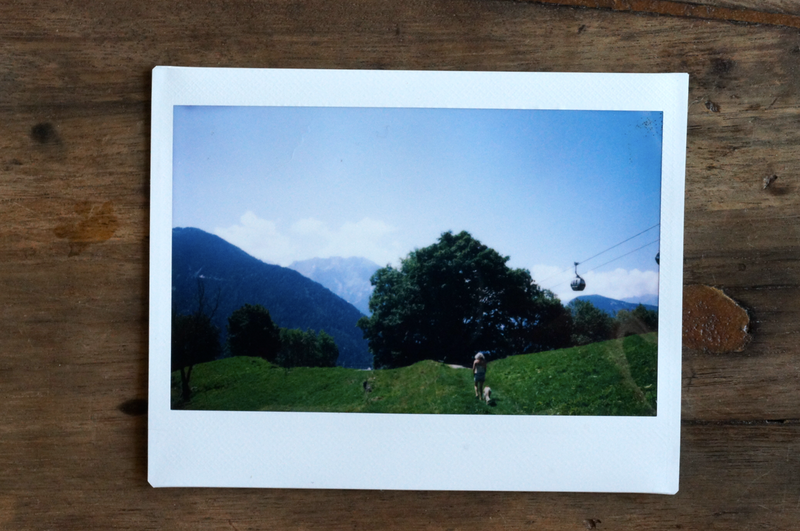 Yesterday I took my instant camera with me on our lunchtime dog walk. I took a series of four photos, carefully stashing the prints in my pocket. The sunshine truly returned to us yesterday, just in time for Swiss National Day. We chose a little walk that winds its way through the forest before breaking out onto a meadow so we didn't overheat in the midday sun. Despite our precautions, we retuned home boiling hot. Ice cream was the only answer. Pour 250ml of the double cream into a big bowl and set a sieve over the top. Prepare a ice bath in a bowl (or at least a sink in which you can pour very cold water). Melt the butter in a big saucepan. Add the dark brown sugar and the salt and whisk till smooth. Whisk in remaining 50ml double cream and the milk. Warm over medium heat. Meanwhile whisk the egg yolks together in a small bowl. When the milk and sugar mixture is hot pour a small amount into the egg yolks while whisking the yolks constantly. Scrape the egg mixture back into the pan and whisk together. Heat until the mixture thickens to custard (it should coat the back of a wooden spoon). Pour through the sieve into the bowl with the remaining cream. Add the vanilla and whisk together. Cool by placing the bowl into the ice bath or cold water, being careful not to let any water get into the mixture. When at room temperature cover with cling film and refrigerate for at least 4 hours or overnight. Preheat the oven to 175C. Melt the butter in a medium frying pan. When melted remove from the heat and toss in the pecans, stirring so they are totally covered. Sprinkle the salt over the top and stir again. Spread the pecans out on a baking tray. Place into the oven and bake for 10-12 minutes, stirring once in the middle. Take out and cool before chopping into small pieces. Churn the ice cream base according to the instructions that came with your machine. In the last minute add 2/3 of the buttered pecans. 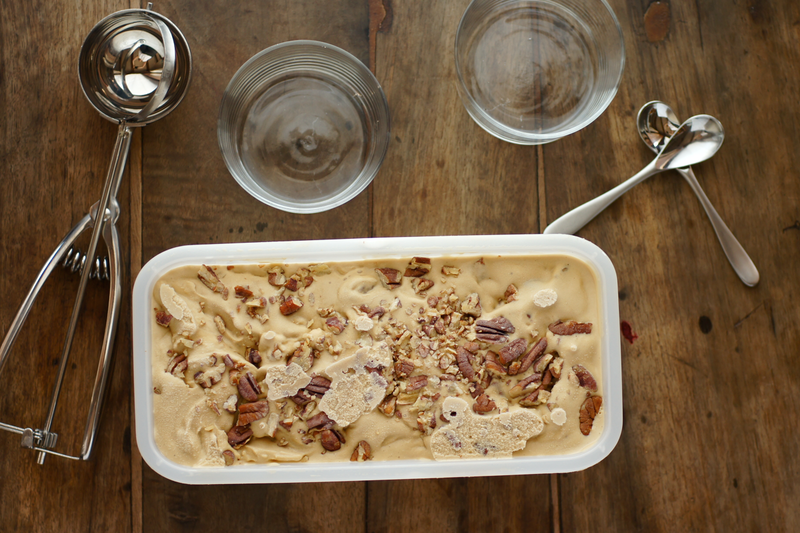 When it is ready, spoon into a tub, layering the rest of the pecans in. Freeze for a few hours before serving. * As I only had extra thick double cream I changed the amount of milk - if you have normal double cream then use 500ml double cream and 180ml whole milk. Add 250ml of the cream with the milk at the beginning instead of 50ml. You already know I'm a massive fan of David Lebowitz and this was next on my list to make! My boyfriend is obsessed with butterscotch so had promised to make it for him - yours looks incredible so absolutely can't wait. Was thinking I might make it into choc ices but looking at these pics I might just have to serve it straight up! 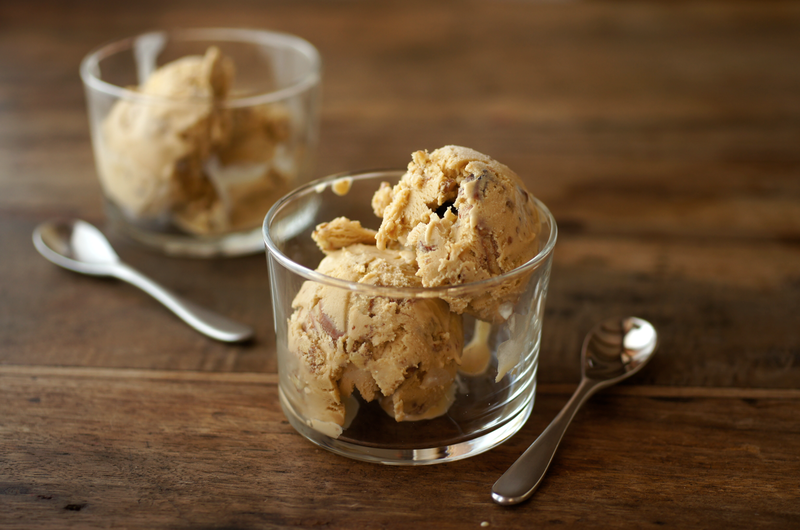 This looks great, I also love butter pecan ice cream! Yummm... Wonderful homemade goodness and true butterscotch flavor make this sweet!Too good to make a single recipe, must double it! This ice cream sounds (and looks) amazing! Loving the new look. My best friend's mum is a body builder so there is always an excess of egg yolks in the refrigerator. Lucky she is also a chef so she turns them into delicious concoctions for the rest of us! thelittleloaf - I'd forgotten it was the nest one on your list! I think I was focusing on the pecan aspect rather than the butterscotch. It's great - you'll really enjoy it! I love making choc ices (post here about them if you haven't already seen it - http://www.poiresauchocolat.net/2010/08/selection-of-choc-ices.html) - they're so fun. 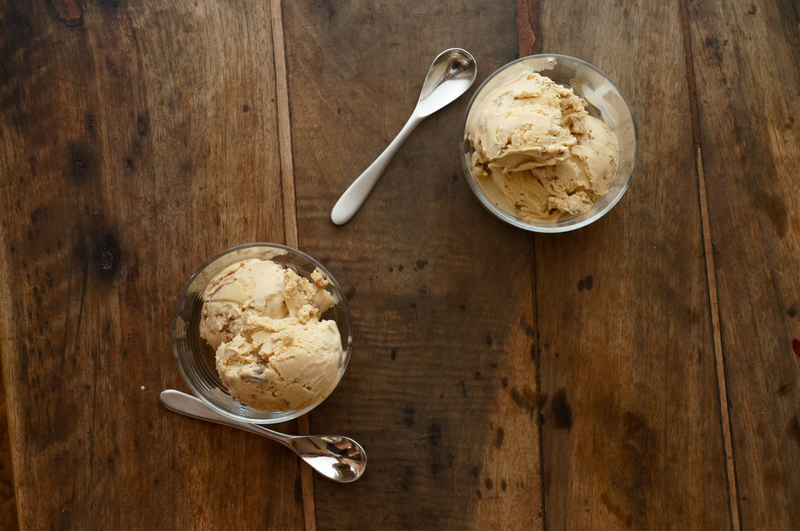 The Procrastobaker - Getting an ice cream maker revolutionized ice cream for me. It's so much fun to make and tastes so much better than regular ice cream. Heidi @ Food Doodles - Yolks are always good. I don't know what I'd do without eggs! It's a brilliant recipe, do try it. simplycooking101 - I've never tried it before as a flavour, I think it might be more of a US thing. Very glad I decided to make it though! Digital Printing - Hehe it is delicious - my ice cream maker (or freezer, or thighs...) couldn't cope with a double recipe though! Sara - ice cream is definitely the way to go in hot weather. Or a sorbet or popsicle...anything frozen really I suppose! Amy - hehe what a wonderful story! Good thing that they don't go to waste :) I've been wanting to try marscarpone in ice cream for a while, good to know it works. lovely photos of this lovely ice cream! i have david lebovitz's "perfect scoop" but i have to admit i haven't tried this recipe yet. i have although tried the pecan mix-in and buttered pecans are SO good. i always keep some extra to snack on! tell me, do you speak german or "schwitzerdeutsch"? i'm a pastry chef from germany (also with an aunt in switzerland) and i've been following your blog for the last months and i really enjoy it! Two fit and fun gals - they're just so much fun to play with. So precious too, which makes me more careful about what I take - good after learning mainly with a digital and being a bit snap happy! Thanks for the comment. Entertaining post - thanks. I think your article is extremely engrossing. Thanks! Your ice cream looks positively delicious! I LOVE the first photo, so beautiful. All of your photos are beautiful. So glad to discover your blog. Wow, 65 meringues!!! That's amazing. You sound like me though, I hate to waste things so if I am ever stuck with left over egg yolks or whites I have to come up with something to use them. Kate@FudgyGoodness - thank you! You should get one - it's one of my favourite cookbooks. Jennifer (Delicieux)- it's always good to work out an awesome way to use up spare stuff - feels like a bonus! Thank you for your lovely comments about the photos. 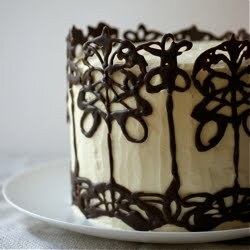 Your blog is beautiful, the images are mouth watering. Bravo! That ice cream sounds and looks so decadent. heaven in every mouthful! This sounds like the best flavour of icecream EVER! Jolene - hehe it is an awesome flavour! kankana - It was a lot but there were quite small :) I didn't realise Haagen Dazs did butterscotch pecan, that's awesome. Glad you have a recipe for it now if it's the only one you like!